The Hargrove Foundation proudly announces a one of a kind science, technology, engineering and math (STEM) after school program for students ages 11 years to 15 years old in Mobile County called the Hargrove STEM Institute. Hargrove Engineers + Constructors will unveil their first adaptive toy as part of the HAT (Hargrove Adaptive Toy) Project on Thursday, October 20th in the Hargrove Courtyard. The initiative is dedicated to filling the gap for adaptive toys among mobility limited children, like the first recipient, who has cerebral palsy. Last December, Hargrove Instrumentation Engineer, Michelle Jones, P.E., met Stefanie Pablo during a field trip with her son who shared about her daughter, Emma’s, special mobility needs. From that moment forward, Michelle became dedicated to using her engineering expertise to assist children with special mobility requirements. On Thursday evening, the first adaptive toy “EMMA” (Engineered Machine for Mobility and Access), named in honor of our first recipient Emma Pablo, will be unveiled to the 11-year-old girl and her family. Many mobility limited children do no not qualify for an insurance-provided electric wheelchair as they must prove their ability to independently control the chair before they can receive aid. These adaptive toy EMMAs will provide a convenient, accessible pathway for development of the necessary skills to meet the insurance requirements. Studies have shown that the ability to control one’s movement through space has a direct impact on social, cognitive and speech skills. Therefore, providing mobility limited children with access to these adaptive toy EMMAs has the potential for additional life changing impacts. Each EMMA can be customized with headswitches, joysticks and push buttons to accommodate individual needs. Future recipients of single-function EMMAs will be randomly selected. As of January 1, 2017, physical therapists will have the ability submit applications for potential users. Thursday’s event also includes a ribbon cutting ceremony celebrating the launch of harGIVES (Hargrove Innovative Volunteer Engineering Services), a new volunteer organization that provides the means and opportunity to give back to the community utilizing Hargrove Teammates’ engineering and technical expertise. harGIVES was founded so that the Teammates’ desire to give back would not remain unrealized due to lack of resources. Launching the harGIVES organization as a 501(c)3 has allowed the company’s passion for volunteerism to take on a variety of creative, hands-on projects. The Hargrove Foundation exists as a means to financially support charitable causes, while harGIVES enables Hargrove Teammates to engage in specific projects as a volunteer organization with the ability to provide goods and services. Through the use of volunteers, harGIVES hopes to produce 10 individualized single-function cars per year. harGIVES has also partnered with the University of South Alabama’s Capstone Engineering Program to produce multi-functional EMMAs for donation to places which serve mobility limited children including schools, camps and physical therapy offices. Through a contribution by the Hargrove Foundation, the Delta Bike Project (DBP) will be better able to focus on improving and expanding their Time is Money Program, Build a Bike Program, and bike maintenance classes. The DBP is a bicycle community dedicated to promoting and improving access to bicycle transportation and quality of life in Mobile, Alabama. Thanks to a contribution by the Hargrove Foundation, more than 100 youngsters will have the opportunity to participate in the Bay Area Food Bank’s Cooking Matters program for children. Cooking Matters is a hands-on cooking class for children ages 10 to 14 years old. The program’s goal is to teach youngsters how to prepare nutritious meals and have fun at the same time. The University of South Alabama (USA) presented Emaleigh Sargent and Shawn Morris with the Hargrove Foundation Engineering scholarship at a luncheon on Friday, May 1st. The Engineering Awards Luncheon, hosted by USA’s College of Engineering honored recent scholarship recipients and donors. The Baton Rouge Office Accepts the ALS Ice Bucket Challenge with LSU Fans Taking the Win over the Crimson Tide! The Baton Rouge office accepted the ALS Ice Bucket challenge from the Mobile office, but the LSU fans were able to stay out of the cold! The recent Amyotrophic Lateral Sclerosis (ALS) Ice Bucket Challenge has undoubtedly created a social media phenomenon by flooding Facebook news and Twitter feeds with videos of people accepting the challenge of having ice water dumped on them or donating $100 to ALS.org. Many people have chosen to do both, and the ALS Foundation reports that donations from the Challenge have exceeded $88 million. Hargrove’s North Alabama Division had the pleasure of sponsoring two families this 2013 Christmas season through the Committee on Church Cooperation (CCC). On October 24, 2013 several of Hargrove Engineers + Constructors Mobile Teammates participated in the Annual Leukemia & Lymphoma Society's Light the Night Walk raising over $2500 to fight blood cancers. Hargrove Engineers + Constructors Memphis Teammates banded together to sort, inspect and package donated foods at the Receiving Warehouse of the Mid-South Food Bank in midtown. Carmen Thompson, Leigh Portner, Jennifer & Pat Danehy (Mid-South Food Bank Chairman), Becky Palazolo & husband Tom Breen, Bilyana Baser, and Gina Farmer volunteered in this very worthy cause. By the end of the evening, the Hargrove team enabled the Food Bank to distribute 1,500 meals to the community. Great job team! The mission of the Mid-South Food Bank is to fight hunger through the efficient collection and distribution of wholesome food, and through education and advocacy. Their vision is a hunger-free Mid-South. Thank you to everyone who participated and we look forward to volunteering again with the Memphis Food Bank. Do Your Part for a Healthy Heart! Hargrove Engineers + Constructors is participating in the American Heart Association Heart Walk on Saturday, September 21st @ 9:00am on the campus of the University of South Alabama. Participating is easy...simply join a team and then do your best to collect donations. For so many of us that volunteer for the American Heart Association, our passion is personal. Whether it is a family member or a friend, we are all connected by the common thread of cardiovascular diseases and stroke. Funds raised through the Heart Walk will support the American Heart Association’s mission of building healthier lives free of cardiovascular diseases and stroke. Will you take 5 minutes this week to register so we can kick-off the Heart Walk fundraising season? If you have participated in past years and are not currently registered, please sign up today. We need your experience and expertise in order to continue our tradition. If you have never participated in the Heart Walk, I hope you will consider joining a team this year! We encourage and welcome everyone to be a part of this life-saving event! Help support McKemie Place by visiting Little House Midtown located at 2351 Airport Blvd., Mobile, AL 36606, August 12-15. For four days Little House Midtown will donate 10% of all net sales including Gift Certificate Sales to this great organization. McKemie Place is the only overnight shelter for single, homeless women in all of Mobile, Washington and Baldwin Counties. As proud supporters of this organization, Hargrove commends Little House Midtown and patrons for giving back to the community. Hargrove Teammates receive a painting from one of the camp attendees. Hargrove Engineers + Constructors Teammates served dinner to over 250 campers and staff at Camp Smile on July 17, 2013, to show their support and promote awareness of the United Cerebral Palsy’s mission, which is to empower children and adults with disabilities to live their life without limits by providing an inclusive summer camp experience where there is no limit to the adventure. The UCP hosts Camp Smile each year to give campers a chance to take part in outdoor activities that many would not be able to do otherwise. Horseback riding, water sports, and the ropes course are all part of the fun, and encourage bonding with others who share similar life experiences. “The thing that was most touching for me was when Weylan, one of the campers, presented us with a painting of a tree with each of the kids fingerprints as leaves as a thank you. To be part of the evening and seeing the joy in everyone’s eyes was really special,” said Marisa Inge, Hargrove’s Community Projects Coordinator. Over 25 Teammates took part in this unique team-building experience. After dinner, campers and Hargrove Teammates attended a camp-wide dance, which was thoroughly enjoyed by all. Mobile, AL - Hargrove Engineers + Constructors donated 28 computers and monitors to replace the ones damaged or destroyed by the Christmas Day tornado that tore through mid-town Mobile, devastating Murphy High School. Patricia Hunter, vice principal of Murphy High School, accepted the computers on behalf of the school and thanked Hargrove Engineers + Constructors’ for the donation. Hargrove donated these computers to help the school return to normalcy during this time of crisis. The tornado destroyed the largest high school in Alabama, along with most of the technology in it. Recently, the Alabama State Legislature passed a $30 million bond; $15 million of it will go toward restoring Murphy High School. The rest of the money will be distributed to five other high schools damaged by tornadoes. Mobile, AL - Hargrove Engineers + Constructors hosted a group of 11 eighth-graders from Clark-Shaw School of Math and Science as part of the AT&T Vital Link “Internship” Program. AT&T Vital Link is organized by the Mobile Area Education Foundation in order to help students connect what they are learning in the classroom with opportunities in the workplace. “By engaging these students with hands-on activities, like navigating through 3D modeling software and designing a project from front-end estimating through construction, we hope to instill a desire to learn more about engineering and show students that what they learn in the classroom today can shape their future career,” said Amy Driskell, Hargrove’s Vital Link coordinator. The four-day internship introduced the field of engineering and design to the students, providing them with an insight into each discipline represented at Hargrove. Most of the students agreed their favorite activity was the “egg drop,” where students designed and built a vehicle to safely transport an egg from the top of a two-story building to the ground. This project stressed the importance of planning and budgeting, two key aspects in the engineering field. AT&T Vital Link is based on the theory that students are best motivated to learn if they understand the connection between skills learned in the class and those needed for success in the workplace. A select group of students and teachers spend one-half day for a week as interns in Mobile businesses to experience the importance of communication skills, mathematics, creativity, problem solving and teamwork. 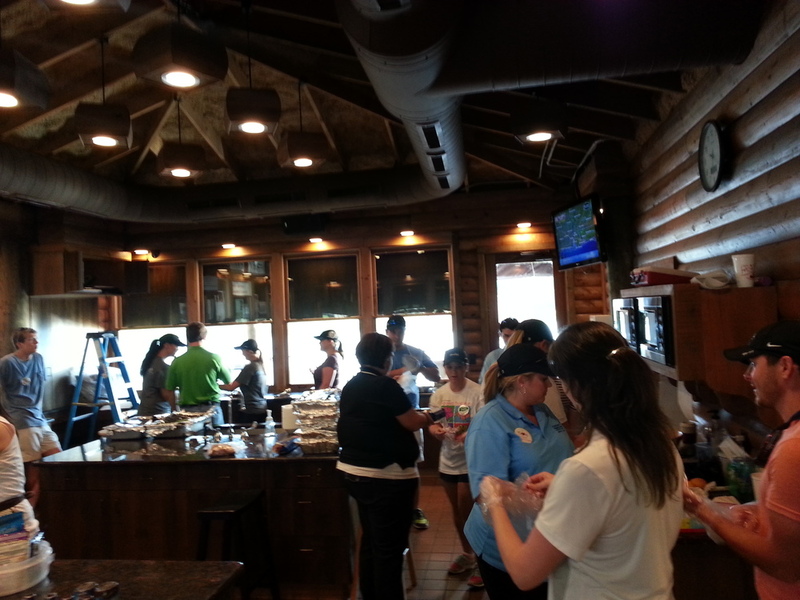 Mobile, AL – Hargrove Engineers + Constructors’ Teammates and families visited Camp Rap-A-Hope to support the camp’s vital role in helping children with cancer and cancer survivors by serving dinner to the campers and counselors on the final day of the camp. Hargrove Teammates cooked, set up food stations and served the campers, continuing the tradition of providing the Friday evening meal. The volunteers demonstrated Hargrove’s spirit of “giving back to the community in which we live” and enjoyed interacting with the campers. “We are glad that we could contribute so much to a wonderful cause and really enjoyed spending time with both the campers and counselors,” said Kristen Burchfield, Community Projects Leader. One of the most memorable moments of the night involved the servers interacting with the campers and trying to get them to eat turnip greens. Hargrove’s relationship with Camp Rap-A-Hope began about 5 years ago, and the Team looks forward to this event each year. Camp Rap-A-Hope is an organization that provides a weeklong summer camp at Camp Grace in Mobile, Alabama and is open to children between the ages of 7 and 17 who have or have ever had cancer. For more information, please visit http://www.camprapahope.org. Hargrove Engineers + Constructors is a full-service engineering, procurement, and construction management firm with offices located across the eastern half of the United States. With more than 800 Teammates, Hargrove is Alabama’s largest privately held engineering firm focused on the manufacturing sector. Hargrove’s success stems from its focus on building a team of the best engineers and construction professionals while maintaining long-term customer relationships. For more information about Hargrove, please visit the company’s website at www.hargrove-epc.com. 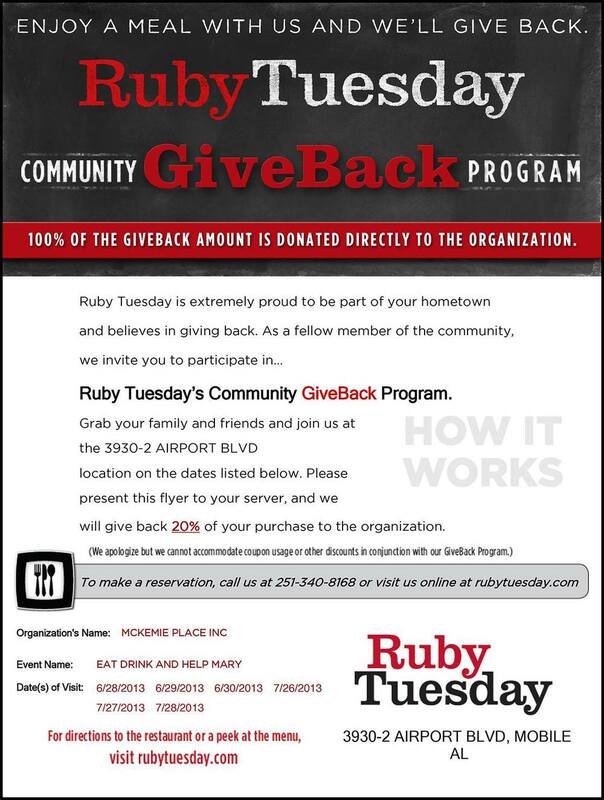 Print out this image and bring it into the Ruby Tuesday on Airport BLVD in Mobile to give 20% back to the community. Ruby Tuesday’s on Airport Blvd is raising money to support McKemie Place, a women’s only homeless shelter in Mobile. Hargrove and our Foundation have supported this shelter, and we are happy to see other companies giving back to our community. Visit the Airport Blvd location of Ruby Tuesday on one (or all) of the dates listed below, present the attached flyer to your sever, and Ruby Tuesday’s will donate 20% of your purchase to the shelter.